When I saw this cartoon it made me smile and laugh. Have you ever been in a conversation with someone either on text or instant message and it comes up “typing” or like on the iMessage you see the three dots moving? You are watching it waiting for the message to appear. Then it stops and you are waiting and waiting and waiting then it finally appears. That waiting especially if you are waiting for an answer seems to take forever. Even sometimes it seems like they are answering you and then nothing. You are saying “come on why is it taking so long now. It has stopped with the dots...Where is my message?” This is like waiting for an answer to a prayer or a question you have for God. One part that I liked with this is that you know that person is there in the conversation at that time. Either they are answering you, asking you a question or relaying something to you. You see it. That question of “Did God hear me?” or “Is He going to respond?” will not be asked. You would be able to see that something is coming and now you just need to wait. I know this will not happen but in todays age when we are getting, if not already used to, this quick answer or reply we lack that idea of faith with patience. We do need to... well I should say I know I sure need that “faith with patience” more. I am not good at waiting for that answer. God always hears us. We may think that He doesn’t at times because we are not hearing a reply at all. With iMessages we can see that it was delivered and even sometimes read, if the person has that setting. We shouldn’t need that with God. He does hear each and everything we say to Him. When you text someone off your network all you get is that it was sent. Thats all. You don’t know they got the message or if they even read it, until they respond directly to you. God is not off our network, He is the network. We do not have to say to Him as in the Verizon commercial “ Can you hear me now?”, He does hear us. It is God who says to us “ Can you hear Me now?” . We are the ones that do not respond, read or get impatient. 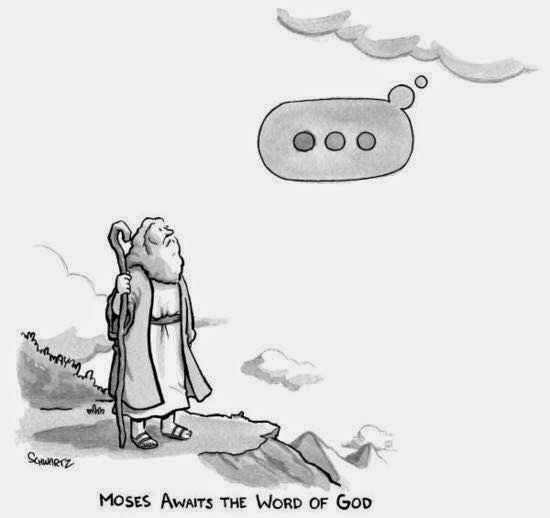 This cartoons shows to us that we all must wait for God’s word to come to us like Moses. God speaks to us the same as He spoke to everyone in the bible from day one till now. We may have many ways to reach each other 24/7 and ways to make sure the message was received and read but God has that same connections as before. Open your heart, soul and mind and make that connection and wait for the reply. Until tomorrow, God Bless, and God said “Can you hear Me now”?